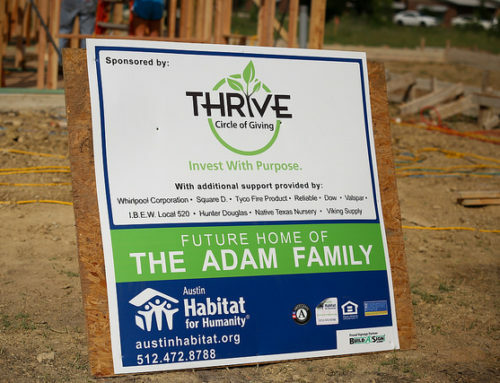 The home building project for the Adam Family, sponsored by the Thrive Circle of Giving Program and Austin Habitat for Humanity, is scheduled to begin Saturday, June 5th at 8:00 a.m.. Read more about Abdalla and Enaam Adam, and how you can contribute in helping Thrive FP eliminate poverty housing. Abdalla Adam and his wife, Enaam, are an extraordinary young couple who are focused on education and building a bright future together. The two met while attending school in the Sudan but Abdalla decided, in order to achieve the higher learning he desired, he needed to move to the land of opportunity. Enaam, decided to stay in the Sudan and finish her Master’s degree in Statistics, with plans to meet him in the United States when she graduated and he had found stability there. Abdalla set out on his journey, hoping to find a better education, a better job, and a better life for both of them. He moved from the Sudan four years ago and now attends school at Austin Community College working towards his degree in Computer Engineering. He was able to find work at a local tech company doing materials analysis. The only thing standing in the way of Abdalla’s American dream was a stable, affordable, safe place to bring Enaam home to. He currently lives in a small apartment with a roommate and knows this is no place for a husband and wife to live and grow their family together. When he discovered the Habitat program, he knew this was the missing piece. He knew it would be hard work but hard work is nothing new to Abdalla.